Charlock is a common weed found on arable land, roadsides and waste ground. The yellow flowers, about 2 cm across, are clustered around the top of the stalk and have 4 petals. 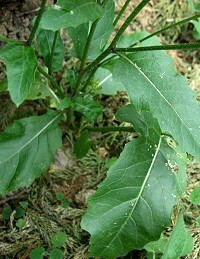 The leaves are narrow and pointed and can be eaten when young. 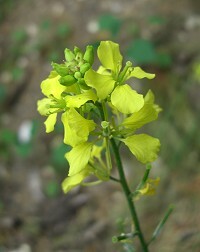 The flowers are followed by long cylindrical seed pods which can be used to make mustard.